Most people avoid the topic of death, let alone be interested in something about coffins or graveyards. As Freud put it, it is the life energy that makes us not want to think about death. However, some of us also have a predominantly ‘thanatos’ fuelled mind. Such people are driven by the death energy and seem to get attracted to anything that is related to death. 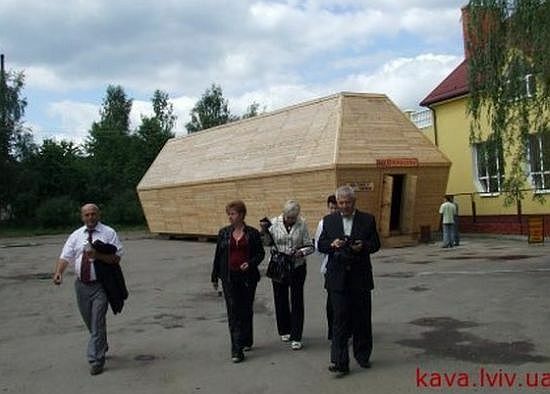 Meanwhile, undertakers in Ukraine who are quite morbid themselves built the world’s largest coffin measuring 20 metres long, six metres wide and six metres high. They didn’t just build the coffin but also created a death themed restaurant. The restaurant ominously called ‘Eternity’ seeks to attract people to the resort town of Truskavets near the Polish border. Morbid patrons can order death themed dishes like ’40 days’, ‘Let’s meet in paradise’ etc. The tables are all coffins and have a candle each, to add to the funereal atmosphere. The restaurant also has a number of death and funeral related paraphernalia to keep diners interested. Cyclops Mouse Mod – Creepy yet cool!